In SAS Triangle construction we need length of two sides and the angle. But the angle should lie between the two sides. Construct a ΔABC, in which ∠B = 700, AB = 4.8 cm and BC = 5.2 cm. Before doing construction, draw a rough sketch, so that you will get an idea which side is taken as a base.Here after drawing a rough sketch, we are sure that the base is AB = 4.8 cm. Step 1 : Draw AB = 4.8 cm. Step 2 : Using protractor, draw ∠ABK = 70 0 . Step 3 : On the line segment BK, cut off BC = 5.2 cm. 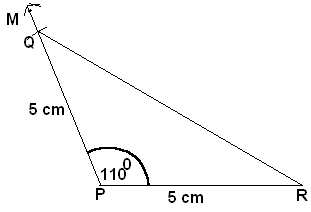 Step 4 : Join A and C.
Construct an isosceles triangle PQR such that PQ = PR = 5cm and P = 1100. Step 1 : Draw PR = 5 cm. Step 2 : Using protractor, draw ∠QPM = 110 0 . Step 3 : On the line segment PM, cut off PQ = 5 cm. Step 4 : Join Q and R.
ΔPQR is the required triangle. 1) In a triangle ABC if AB = 3 cm , AC = 5 cm and ∠B = 30°. Can we draw this triangle uniquely ? 2) Can we Construct ΔABC such that AB = AC = 5cm and ∠A = 60°? 3) Construct a ABC, in which ∠B = 70, AB = 4.8 cm and BC = 5.2 cm. 4) Construct a PQR, in which ∠Q = 135, PQ = 5.2 cm and QR = 6 cm . 5) In a triangle ABC if AB = 3 cm , AC = 5 cm and ∠B = 30°. Can we draw this triangle uniquely ?